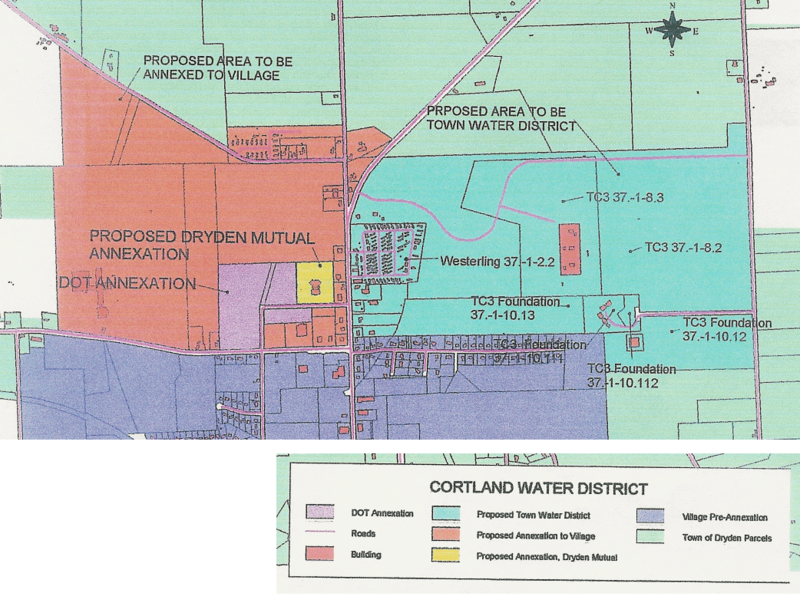 Cl Hattery said he and ZO Slater and Mayor Taylor had been discussing getting the 2nd parcel-based annexation proposal and the possible solutions for getting water to the current Cortland Road Sewer District. They discussed about splitting the interests partly based on responses to the meeting organized by Michael Lane and ZO Slater's knowledge of the preferences of some of the property owners. There was bill introduced last year that didn't get passed by the Assembly that would permit two municipalities to initiate a larger scale annexation and one of the things they discussed between themselves and with Senator Seward's staff was the possibility of using that on a special bill basis. They talked about the potential for an annexation that took the west side of Route 13 as an annexation that would build on where the two requests for annexation have been, and creating a water district on the east side, which is largely the TC3 property and the Westerling mobile home park. He met with Mayor Taylor and Supv Trumbull and Assemblywoman Lifton today, and she seems generally favorable to that. Cl Hattery distributed a map of his proposal and said he is making this proposal as a way of trying to get past this loggerhead and get water to the entire area. The use of the proposed special bill would include both boards agreeing that this is a good annexation and will then be voted on by the property owners. Cl Christofferson said he had the sense that people were generally not in favor of annexation and Cl Hattery said he wasn't at the public information meeting, but was getting feedback in favor of annexation. Cl Stelick asked if there was annexation would every property owner have to hook up, and Cl Hattery said no. Atty Perkins said he believed the Village's position is if you are in the Village you do hook up to water if the line runs past your property. The Town's policy in the past for a water district has been that you are not required to utilize the water line as your water source, but you will pay the benefit assessment whether you hook up or not. Cl Stelick said Karel Westerling has stated clearly that he has his own well and wasn't interested in annexation, and Cl Stelick doesn't think he would be interested in a water district either. Cl Hattery said one way or another, that side of Route 13 has to be provided service. There are users on the east side of the road and there has to be some infrastructure up there and the Village can't do it. In the long run a district would respect Westerling's investment and the fact that he manages his own water system and has a license, and as regulatory authority increases over small water systems, it may get too costly for him and he may want a district-based water supply. M Lane noted that both Karel Westerling and the Nortes had said they didn't want annexation or a water district, and he found that troubling, saying that they didn't hear from people in the trailer park about having municipal services there. Cl Hattery said the public users on that side of the road need a solution (the ones already served by the Village water system) that can't be accomplished under the current arrangements. The Village can't go out there and make an investment. ZO Slater pointed out that Village believes the water line on the east side of Route 13 is in dire need, and is the most attended line they have. Cl Michaels said he thought the business owners and residents of the trailer park would benefit in terms of having a police force close by. The business owners had indicated they wanted water service. Cl Hattery said this idea has some possibility legislatively and asked the board to consider it and suggest any changes. He said the Town needs to move ahead in some way. Cost is an issue for infrastructure since the DOT deal is apparently stalled. Cl Christofferson and Cl Hattery suggested a survey could be conducted of the owners and residents once cost figures have been agreed on by the municipalities. Annexation does make sense to me, though I know not everyone in the area is excited about it. 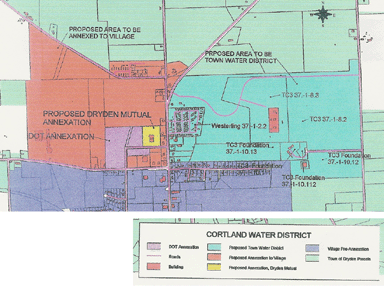 I really wonder if a water district in place of annexation for the east side makes sense in the face of the Village's preference to extend their water supply only in the Village, but maybe they're showing more flexibility lately. If you want a parcel-by-parcel list of which properties are in this area, Hattery provided a list (418KB PDF). There will undoubtedly be more to come on this story.